Clouds! Mayors! Explosions! Lawn mowers! 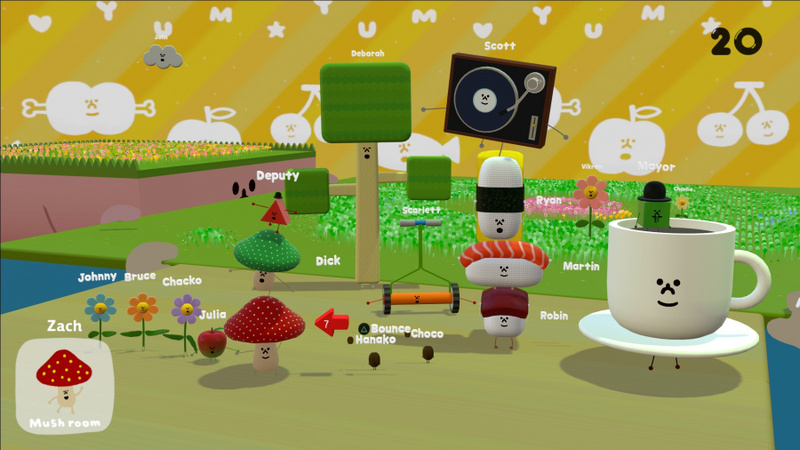 Considering that Wattam is the latest game from Keita Takahashi, the creator of Katamari Damacy and Noby Noby Boy, it's little surprise that the PlayStation 4 exclusive is almost impossible to describe. Brand new footage filtering out of an event hosted in Los Angeles last week shows the crazy collaboration between Sony and developer Funomena – and even though we're not entirely sure what's going on, we want it right now. The gameplay loop appears to revolve around hand-holding. Link arms with a named accomplice, and you'll be able to create bigger and better rainbow explosions, which will attract more characters into the scene. It seems that each of these personalities will have different attributes, such as the ability to mow the lawn or play some disco tunes. Playing with each of these protagonists should provide plenty of entertainment value, but it's unclear if there'll be any more to the package than that. Either way, we're 100 per cent on board. While the indie scene is booming, bonkers releases such as this seem like something of a rarity in this day and age. Hopefully we'll see more of the title at E3 – as well as a release date, perhaps. Looking awesomely crazy. Spent far too long on Noby Noby Boy, and this looks like a similar idea! Can't wait! See I love the look of this, but I have to say I really didn't like Noby Noby Boy. This looks more entertaining by far. This looks....weird...but also enjoyable at the same time.